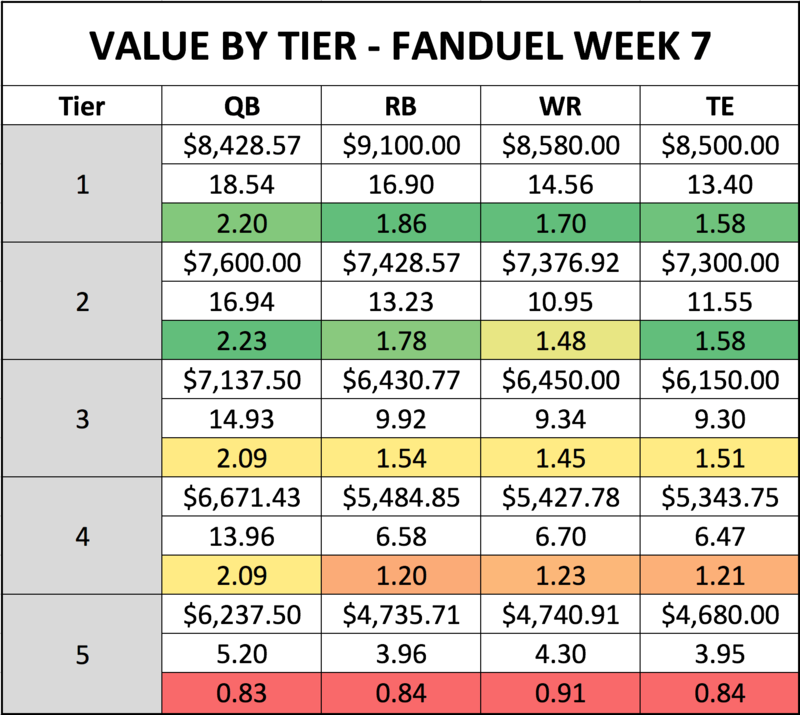 Here’s our weekly look at several FanDuel cash game strategies you can deploy in Week 7 of the fantasy football season. Week 6 had so many value plays that building lineups was comfortable. Turns out, that was just a one-week reprieve. We’re back to tighter pricing in Week 7, which means building lineups becomes a little more challenging. The Box: The first row within each tier represents the average salary of every player in that tier. The second row represents the average projected fantasy points for every player in that tier. The third row is the average value of each player in that tier (points/salary*1000). The Box is also color coordinated within each position throughout the tiers. For cash games, the tougher pricing at running back and wideout means we need to look for salary relief elsewhere, and quarterback is usually the easiest position to achieve this. That’s not to say there aren’t expensive quarterbacks in good spots. Tom Brady ($9,200) and Matt Ryan ($8,700) will duel on Sunday night in what should be a high-scoring game, while Dak Prescott ($8,400) draws the winless 49ers. Drew Brees ($8,300) should also light up the hapless Packers secondary. If you can find a way to squeeze one of these guys into your lineup without sacrificing too much elsewhere — great. But I think they are more tournament plays this week. Kirk Cousins ($7,500) is priced outside of the top 12, which seems absurd, while Tyrod Taylor ($7,000) and Carson Palmer ($7,000) are viable as well. Taylor is a great spot at home against the worst pass defense in the league. He’ll be the chalk.